Seminars dedicated to exploration and collaboration between the Ordered Universe Research project and the National Glass Centre, University of Sunderland. This is the first meeting of a new partnership, involving creative engagement with medieval science as presented and researched by the Ordered Universe. The OU research project is a unique grouping of medieval specialists and modern scientists focused on the writings on natural phenomena by the 13th century thinker Robert Grosseteste (c.1170-1253). Later bishop of Lincoln, Grosseteste produced 13 scientific treatises between c.1200 and c.1228. These explore the world around him and the universe beyond him: colour, sound, light, astronomy, comets, place and space, the rainbow are some of the subjects he explores. The National Glass Centre, now part of the University of Sunderland, opened in 1998 to celebrate the heritage of glass-making in the North-East, and to develop a glass industry for the 21st Century. A major, international, research centre, with BA, MA and PhD programmes, visiting artists, the Glass Centre has been run by the University of Sunderland since 2010. Taking inspiration from Grosseteste’s treatise on colour, in which he evolves a notion of a three-dimensional understanding of colour as light embodied in a diaphanous medium, Through a Glass Darkly will bring together medievalists, scientists and creative artists to create a series of artistic responses to Grosseteste’s scientific vision. Working with the staff and students at the NGC, and with artists already connected to the Ordered Universe project, Alexandra Carr, Alan Fentiman and Ross Ashton, will deepen Ordered Universe research, nurture new partnerships and produce collaborative and individual outputs for exhibition. 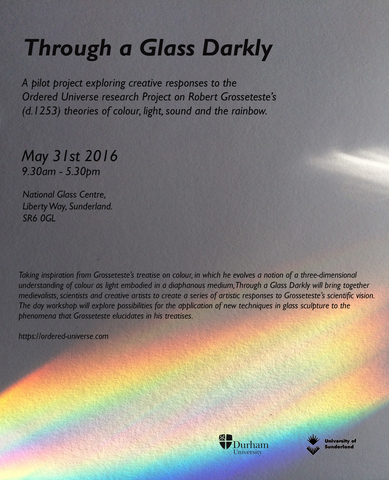 Through a Glass Darkly will take place over the summer of 2016 – it promises to be a wonderful journey, with Grosseteste, imagination, and world-class expertise across a fantastic range of subjects as our guides.